Angie's Curse | A band based out of Ventura, CA providing both traditional and modern day Indie/Gothic/Dark Rock sound with a female lead vocalist. All Contents and Images Rights Reserved by Angie's Curse. Angie’s Curse to release new album by Fall 2015! On Saturday, April 18, 2015 at Golden China’s “The Coven”, Angie’s Curse debuted a new darker sound as well as three new songs and plans to release a new album by Fall 2015. Angie’s Curse shared the stage that night with “Leave the Stars“, Ventura’s newest Indie Band, “13th Sky“, a 80’s Post Punk/Dark Alternative Band based out of Los Angeles, CA and “One Last Caress” a Death Rock Band based out of Fresno, CA. Daniel Niemeier who puts on The Coven has provided our small Ventura community of Dark-lings, a great entertaining local night for dancing and live performance bands. DJ Verlust plays true Post Punk, Goth Rock and Death Rock music throughout the night to get everyone to enjoy the dark vibe, mingle with fellow attendees and dance. Golden China has karaoke every night of the week, and The Coven often allures it’s customers to the dark side by its beautiful people dressed in dark attire. The Coven returns Saturday June 13, 2015 and will be presenting 2 new DJ’s to the line up(DJ Th@d, and Dimitri Slithers) along with our very own DJ Verlust… mark you calendars and get ready to take another trip through the dark and delightful realms of true Goth! It is unfortunate to announce, that Angie’s Curse has had two band members resign. Although it will take some time to replace these members, Angie’s Curse is still a band and has not broken up. We are currently looking for a new bass guitarist and keyboardist. Angie’s Curse will continue writing new music during this process and will have a new lineup of musicians, live performances and a release of a new album in 2015. We are extremely excited and looking forward to releasing new music. Angie’s Curse would like to thank you in advance for your continued support and for all the support you have given us in the past 8 years. 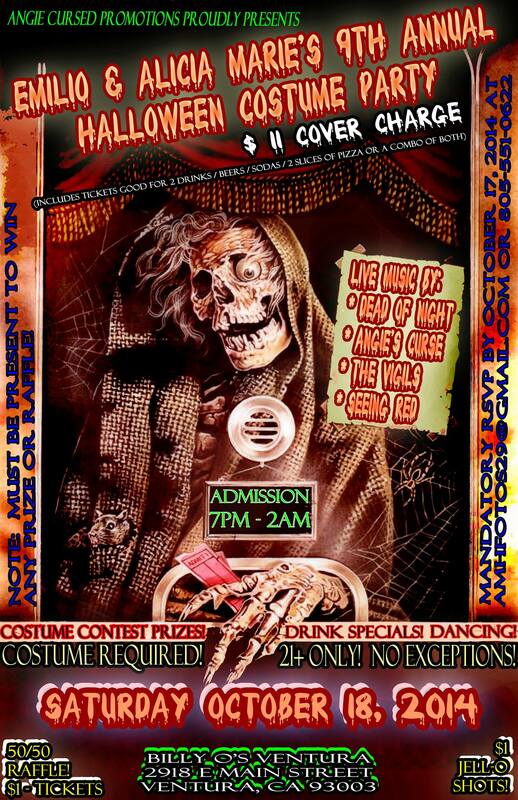 The Dia De Los Muertos “Day of the Dead” Live Music Showcase to feature 4 Local Rock Bands! Bombay Bar & Grill will honor our past and celebrate our future with The Dia De Los Muertos “Day of the Dead” live music showcase featuring 4 local rock bands. 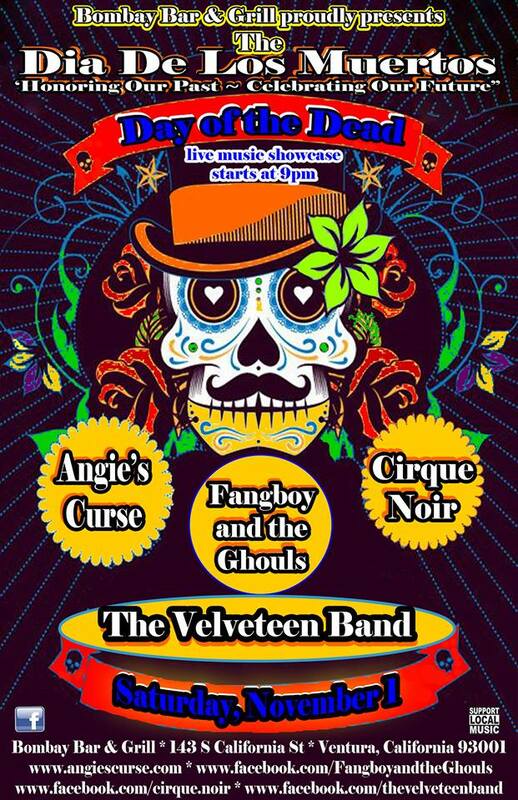 The Velveteen Band, Fangboy & the Ghouls, Angie’s Curse and Cirque Noir will perform live the night of November 1, 2014. Show starts at 9pm. No Cover Charge! 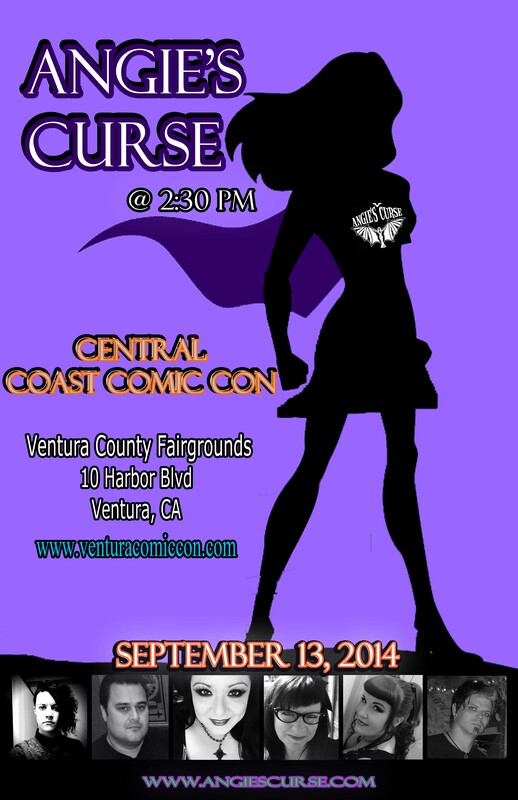 Angie’s Curse to play the 2014 Central Coast Comic Con!